The Instinct of Workmanship and the State of the Industrial Arts, originally issued in 1914, is described by Murray Murphey as his "most important work." In this volume that the theoretical foundations are put forth on full display. Veblen's juxtaposition of the instinctive values of community welfare in contrast to the pecuniary values of commercial exchange was the basis of his later, more famous works. The book makes plain Veblen's basic dichotomy between technological institutions for making goods and the pecuniary institutions for making money. Veblen's book is taken up with the casual processes in the history of culture centered on human instincts and habits. For him, a change in the natural or social conditions produces effects only by changing the behavior of people. The whole panoply of habits, instincts, and motives, points to a theory of social and cultural change which substantially differs from the pragmatic tradition that swept America in the early decades of this century. Veblen makes so many unique contributions and insights that his work outlives the limitations of its theoretical shell. As is the case for most Veblen's works, footnotes and references are sparse, no index is provided, and the reader is left to fill in the missing paraphernalia the way one does with a novel. 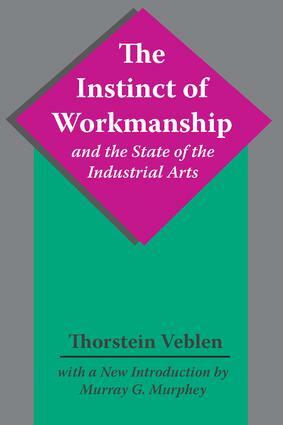 Indeed, the reader is swept along Veblen's captivating rhetoric in seven brilliant chapters moving from the instincts in primitive technology, to the current state of industrial arts, to the examination of predatory culture invited to the civilizational table by the competitive system, and finally into a contrast of handicrafts and machine industry.